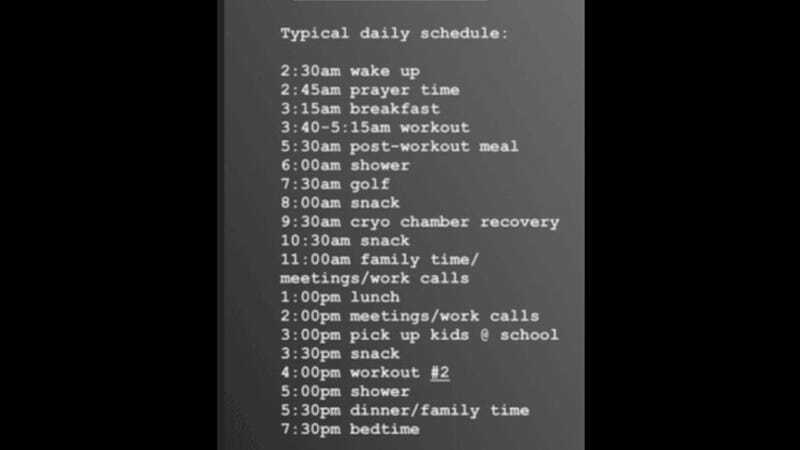 Mark Wahlberg posted a screenshot of his “Typical daily schedule” in his Instagram Stories and half of it is probably fake–even though, it’s totally plausible to me. BuzzFeed can’t wrap their head around such a schedule. The Ringer wonders, “How many prayers can fit into a half hour?” (A lot?) and “How can snack-eating take 90 friggin’ minutes?” (It has to be savored...) How can one man can achieve so much and stay upright from 2:30 a.m. to the tender “bedtime” hour of 7:30 p.m.? Vanity Fair has “so, so many questions” about it. I only have one: Why not? I have a daily schedule as well, and people tell me I’m crazy all the time, but it’s really no big deal. Here it is. Please don’t ask me how I do this. Again, it’s no big deal.